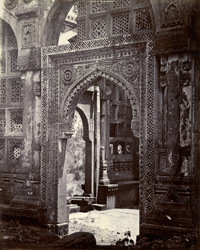 Photograph of the doorway of the east porch of the Jami Masjid at Champaner in Gujarat, taken by Henry Cousens in the 1880s for the Archaeological Survey of India. The Jami Masjid, built in 1523, is a rectangular mosque with an open courtyard. The main entrance portico on the east side of the courtyard is a domed structure raised on a podium with steps on the north and south sides. On each side there were once perforated stone windows, and on the east side there was a projecting balcony of which only the floor has survived. This is a view of one of the richly carved doorways.